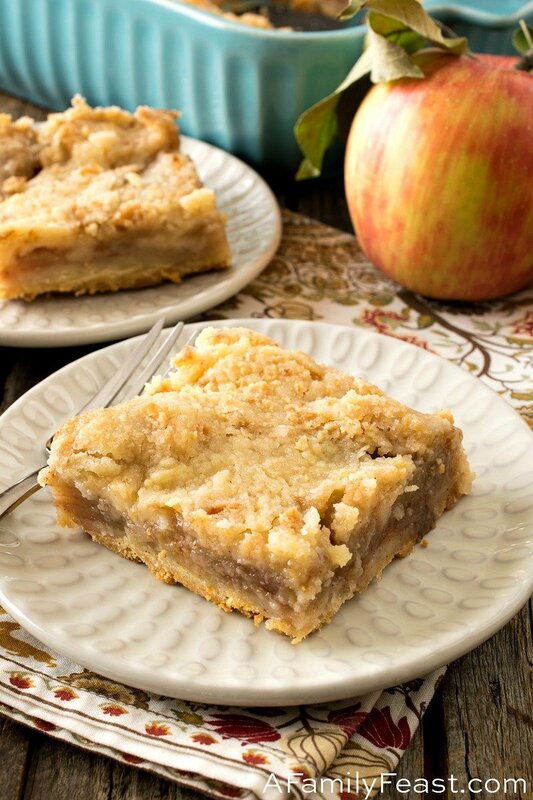 Sweet buttery cookie bars with a luscious layer of apples in-between. 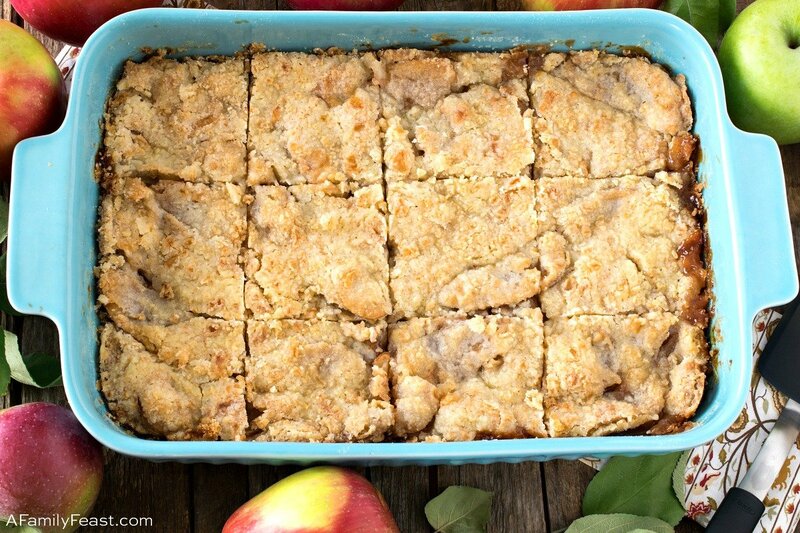 These absolutely delicious apple bars are quick and easy to make! After a trip to a local apple orchard this past weekend, we left as the proud owners of a half-bushel-sized bag of freshly picked apples. We initially bought a smaller peck-sized bag (half the size), but the orchard was brimming with so many different varieties of apples, we traded in for that larger bag – and loaded up! On the drive back home, I spent some time googling apple recipes – and these Apple Kuchen Bars recipe from Taste of Home immediately caught my eye. In addition to looking very delicious, I loved that this apple dessert looked very easy to bake! 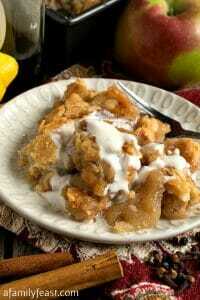 Kuchen is German for cake – and there are many different apple kuchen recipes. 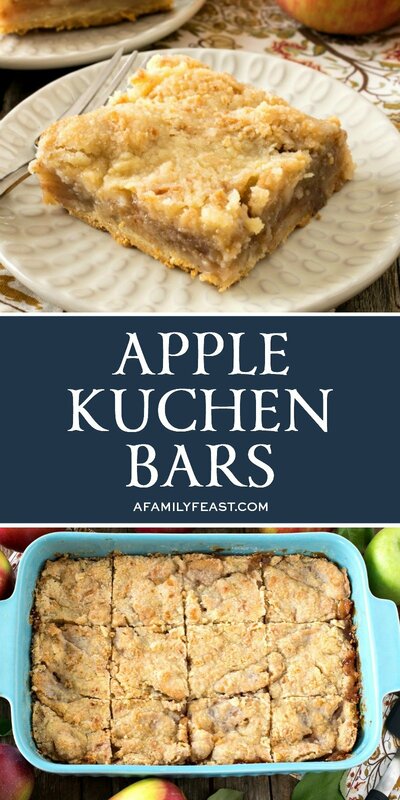 These Apple Kuchen Bars have all of the same wonderful flavors of the traditional cake recipes, but with the texture of a bar cookie. How do you make Apple Kuchen Bars? These Apple Kuchen bars have three enticing layers – a buttery shortbread cookie crumb bottom, sweet slices of apples and cinnamon in the middle, and a crackly sugar topping. As the pan bakes in the oven, the apple slices cook down to a luscious and sweet filling. You can enjoy these Apple Kuchen Bars warm out of the oven (with some vanilla ice cream on the side), or cool the pan completely before cutting into bars. This recipe is very easy to make with a food processor. Both the bottom crust and the top layer are mixed up quickly by pulsing the ingredients to a crumbly consistency. But – if you don’t have a food processor, you could also make this delicious dessert with a pastry cutter and a little more elbow grease. These Apple Kuchen Bars are a must-make recipe for apple season and the upcoming holiday season! Preheat oven to 350 degrees F. Grease the bottom of a 9×13” baking pan or dish. Set aside. While the crust is baking, peel and slice your apples, then place in a large mixing bowl. Add 1 cup sugar and cinnamon, then toss to coat the apples. Pour the apple slices over the baked crust and spread evenly in the pan. Place the remaining 1 cup flour, ½ cup butter, and 1 cup sugar into the bowl of the same food processor. Pulse to combine until the mixture resembles coarse crumbs. Evenly sprinkle the mixture on top of the apples in the baking pan. Bake for 60 to 70 minutes or until golden brown and the apples are hot and bubbly. Cool on a wire rack until firm. (You may refrigerate the bars.) Cut into 12 large squares or 24 smaller squares. This came up in my news feed and caught my attention because of its name since I am German!! I literally jumped up and made it since I had everything at home. I used fresh honeycrisp apples and it is so delicious. Thank you so much for sharing this!! You’re very welcome Natalia! Glad you enjoyed the recipe! I am excited to try this recipe. My family and I just processed about 80cups pealed and sliced apples. I froze in 10 gallon bags. I will have to make these soon. Can’t wait. Wow Ali! How wonderful – you’ll enjoy apples for a long time! Hope you enjoy the recipe! we truly enjoy your website, new to us. when apples are in season, we are in season with apples, using them whenever we conceive of a way to use them…..sauce, fried, roasted, blended with hot peppers for a hp-sauce, cake, cookies, stollen, apple crumble, and so many others.